On the evening of Monday, the 28th of November, in the Norton-Motulsky Hall of Ashesi University College, a diverse group of people within the community assembled to contribute to the process of re-designing the Entrepreneurship Capstone option for final year students at Ashesi. 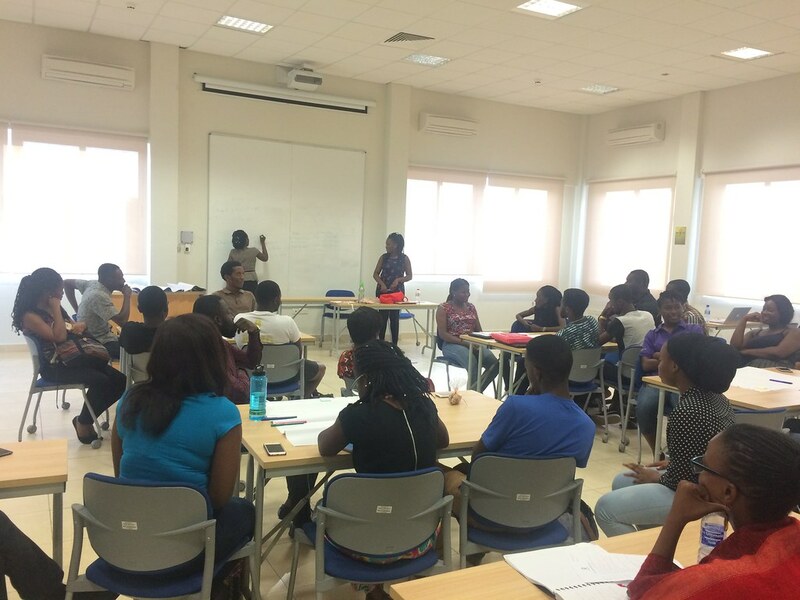 Having begun the re-designing process in July 2016, Dr. Sena Agbodjah Agyepong , the lead entrepreneurship faculty for this course at the university, organized this brainstorm session with the assistance of her faculty intern, Sophia Dery and the Ashesi D:Lab coordinators. The event brought together students who have taken this capstone session, students that are currently taking it and those who will be taking this session in the future: specifically, the class of 2019. The Entrepreneurship Capstone is one of three capstone options that final year students at Ashesi have to complete as a prerequisite for their graduation. A final year student could alternatively write a thesis or complete an applied project. The Entrepreneurship Capstone is a year-long, 2-credit course that requires students to work in teams on identifying opportunities within their environment and developing sustainable and scalable business models for them. The teams of students have the option to implement their business models but have to submit a full, implementable business plan as a final deliverable at the end of the year. In the fall semester of 2015, Ashesi introduced the Foundations of Design and Entrepreneurship (FDE) course, which immerses all freshmen in the experience of using design thinking to explore problem spaces and eventually create and run businesses from solutions identified. FDE gives students the opportunity to start businesses in teams using the Lean startup model among other supporting approaches. This is very similar to the current course structure of the Entrepreneurship Capstone hence the need to re-design it for students who have already taken FDE to find value in an Entrepreneurship Capstone option. Monday’s brainstorm session was kicked off with an insight gathering process where current and past students of the FDE and Entrepreneurship courses shared their likes and dislikes about their learning experiences from these courses. At their core, both courses afforded the students the opportunity to explore the practice and theory of what it takes to start and run a business. FDE, though not as demanding in terms of content and coursework as its capstone equivalent, mandates that freshmen eventually simulate running businesses with little or no prior experience in business management, marketing or financial accounting, a shared challenge among those that have taken and those that are currently taking this course. To arrive at a mutually acceptable co-designed course, teams were formed to tackle the content, structure, evaluation, output and support systems around the success of the capstone course. After continuously empathizing and analyzing their overall experience, while paying attention to pain and gain points, these teams arrived at groundbreaking innovations, most of which could be implemented to give the Entrepreneurship Capstone a new meaning to future students who have taken the FDE course in their freshman year. Some of these include an affirmation on the already existing self-evaluation system within the course, creating support systems for funding and supporting student business ideas and a potential screening process for students looking to hone their entrepreneurship skills. These ideas will inform the new design of the course. Posted in Events, Projects, Restructuring the Entrepreneurship CapstoneTagged Design, Design thinking, Education, Entrepreneurship, Innovation, MusicBookmark the permalink.